On a surprise warm winter day I took time to collect supplies for this project. Most of it came from the stark New England roadside. 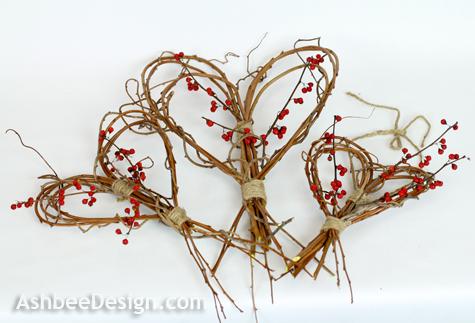 Then, on a much colder day, I stayed inside and made these Valentine hearts for my entry ladder. 6 green twigs- I used the new growth branches clipped from roadside bushes. They need to be 3 feet long with no side branches and very bendable. Test them because some branches snap when bent. Assortment of curly vines - mine were bittersweet which is also quite flexible and also harvested along the roadside. If they snap find a different variety. Take six in one hand. Arrange them so their tips are all within 3" of each other. You don't want them lined up but you also don't want them too staggered. Be sure the tips can bend down to form the heart shape. If they can't, rearrange the sticks. 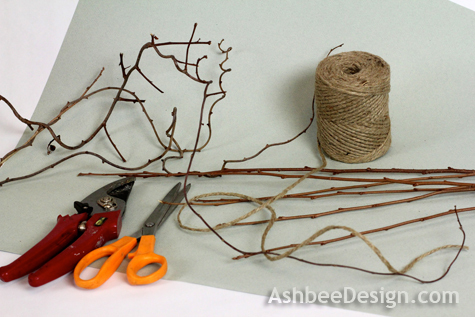 To start this knot take a length of twine about 24" long and make loop running along the twigs as shown above. 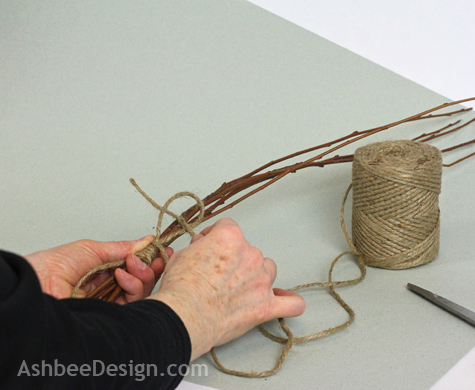 Take the long end of the loop and starting at the bottom of the knot, wrap the twine tightly around the stems and both ends of twine forming the loop. 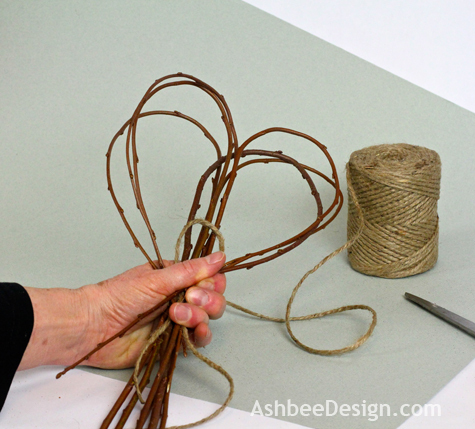 Work your way up toward the loop with tight, closely place wraps of twine. 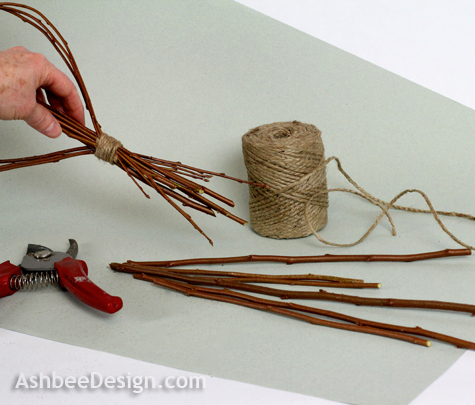 Make 6-8 wraps around the twigs. 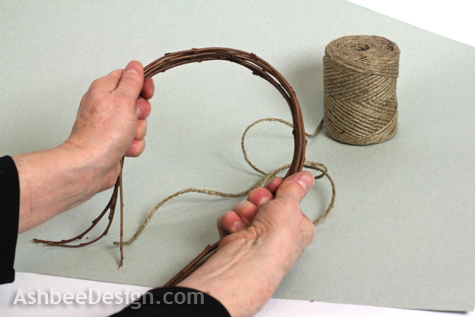 After 6-8 wraps take the end of the twine and thread it through the loop you placed there and pull it tight. Grab the other end of the twine, the end that is still hanging out below all of the wraps and pull it down. It should pull the loop down tightly on the top trapping the end behind the twine rounds. If you don't feel like it has pulled securely into the inside of the wraps then add a dot of hot glue to the ends to hold them in place. When dry cut the twine ends. 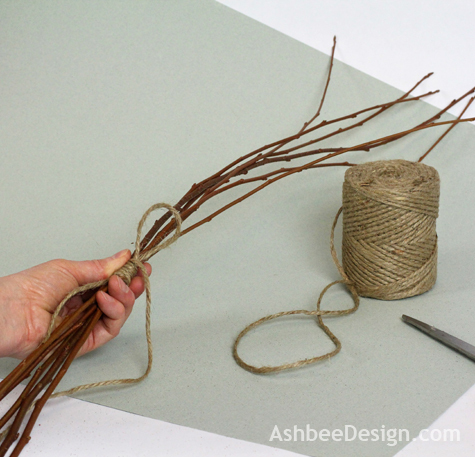 You should have a snuggly wrapped knot holding the twigs together. 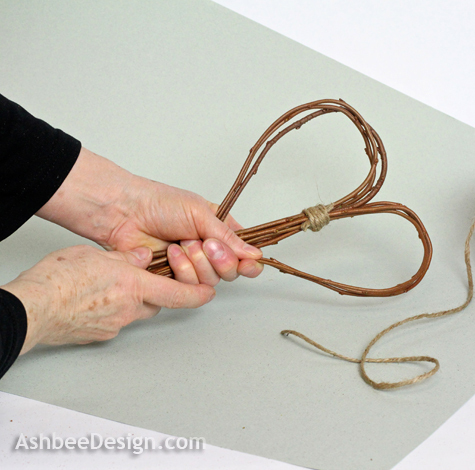 Bend three twigs down on each side of the center to form the heart shape. While holding them in place make a second knot at the base. It is the same type you made above. 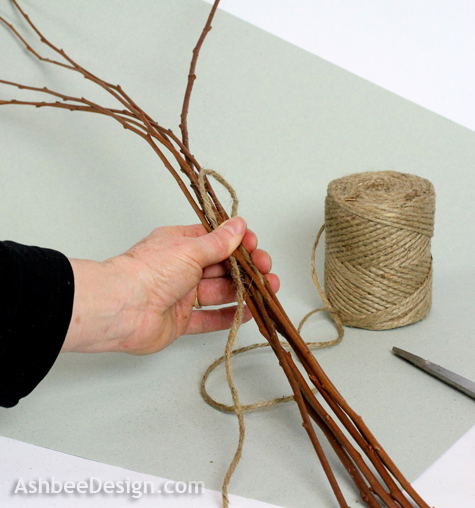 After the knot is complete, take the clippers and clip off the long fat ends of the twigs at an angle. Leave the tips. I left about 4-5" and cut at random lengths. 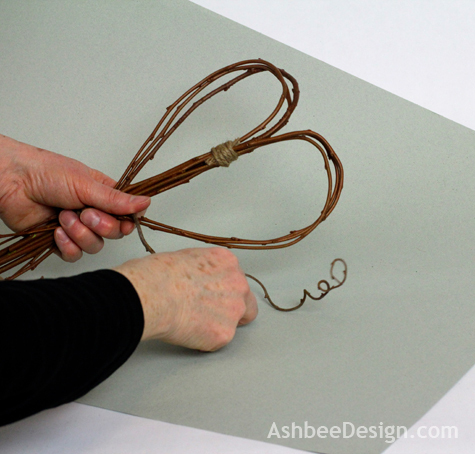 Take short pieces of curly vine, especially lengths with character, and wrap them around the sides of the heart. The vines with their curly ends add a funkiness to the heart. I added 3-4 sections of vine to each heart. Slide short sections of red berries into the knots. 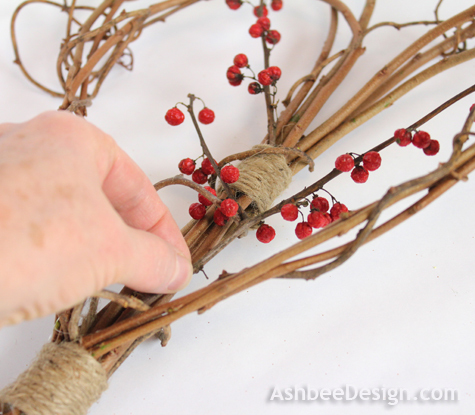 Use a touch of hot glue to hold them in place if you aren't able to get them firmly wrapped in the vine. Then make some more.... to add to a ladder, hang in your windows, or share with special friends. These are so sweet and simple! I love more rustic valentine decor like this. I'd love it if you linked this to my new linky party, "What We've Accomplished Wednesdays." It is live right now. Thanks Deborah. I avoid the overly cutsie and sparkly decor as well. Although sometimes I get colorful! These are adorable. I like items made from twigs. Thanks for sharing. 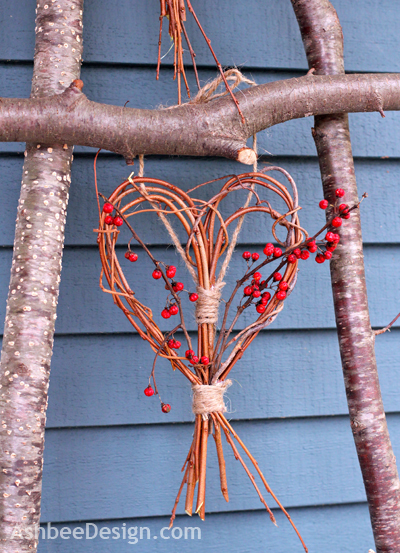 I just finished trimming up some branches after pruning limbs in the back yard for another "branch" project, and then I saw your lovely hearts! More inspiration! 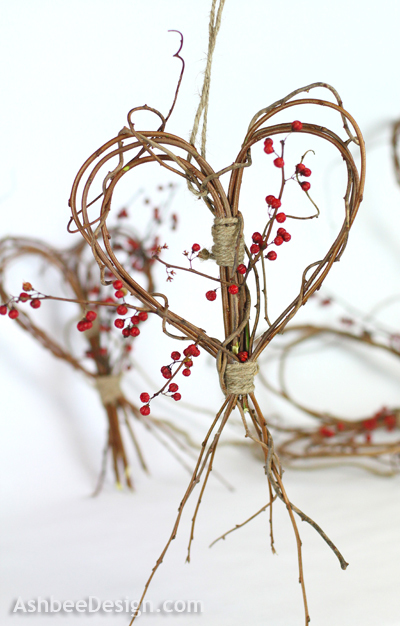 If they are bendable twigs make a few hearts! Quick and easy - and send pics!